Life is definitely more suitable to me here in my Nicaragua home. It is warm here. Problems, and there are some, seem less offensive. Life in general is mas tranquilo. My month in California was productive, pleasant, and I felt very loved by my family and friends. I accomplished getting my West Sacramento house listed with Perry Palamidessi of Coldwell Banker, renewed my CA driver’s license six months early–had to take the written driver’s test on the spot not expecting this to occur–cancelled my US medical insurance, and prepared to renew my CA nursing license in six months. So much for accomplishments in the US. The trip back to NI was successful. I only had to pay for one extra piece of luggage–the box with the Shark vacuum cleaner that I purchased with my United Rewards Miles. The payment for transport was almost the purchase cost of the item in a US store. However, I have a new toy that is like a miracle worker here in my casita that is situated on the dirt road with wind blowing heavily during this season. When I arrived at the customs area in NI, of course, they wanted to look into the box that had not been previously opened in the US by TSA. The customs man wanted to see the factura–sales slip. I told him I didn’t pay for the item. He called his supervisor who started laughing hysterically–saying with a question “libre?”. If I had thought about it, I would have said it was a gift. At any rate, they had to open the box, figured out that it was an aspiradora/vacuum and it was indeed new. They finally sealed up the box after having a bit of trouble putting the attachments back in their tightly programed spaces and I went on my way to the hotel where I spent the remainder of the afternoon and night. The following morning, my friend/chauffeur Byron Vasquez, picked me up from the hotel with my car. We progressed to my first task place BAC bank to complete the opening of my account now that I have a cedula/residency. Mission not successful as they said my papers were all in Rivas where I first applied and it would be easier to complete the process there. OK, mission number two was successful. I now have full insurance coverage for my Toyota Forerunner. Next stop also successful, at least the first part. 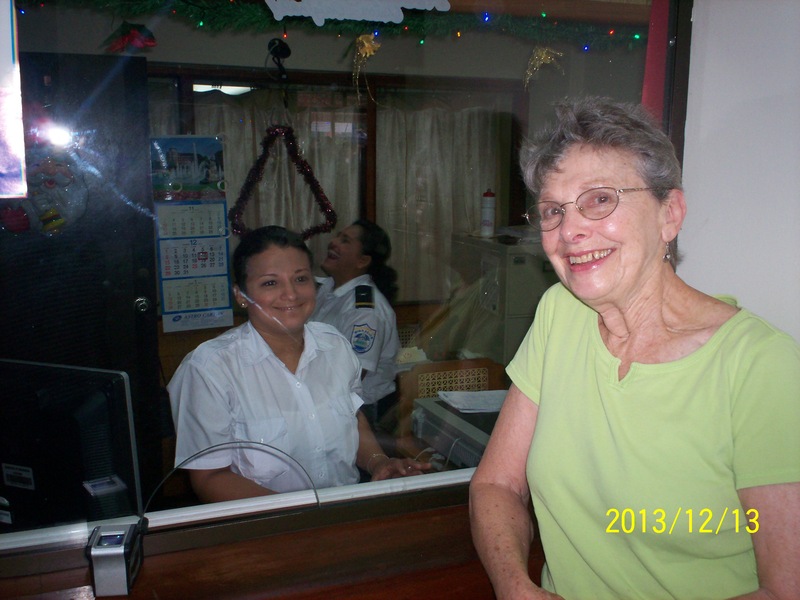 I am applying for health insurance at the Vivian Pellas Metropolitano Hospital in Managua. This is a first class institution that operates as an HMO in the US. Because of my age, I have to return for lab work and a doctor’s consult before they will allow me to pay for health insurance that is comparable to the Kaiser HMO that I had in the US. However, my annual cost is what two month’s insurance cost me in the US. I am a happy camper. Byron and I then progressed to PriceMart, the Costco of Nicaragua, in Managua. I had a purchase list for myself and two of my friends in Limón. The clerks at PriceMart are used to having three and sometimes more items sectioned off for payment that all come out of one grocery cart. Like the Costco in the US, one can buy things much less per piece. My favorites whenever I am there are finding fresh mushrooms and frozen salmon. These items are never available in the stores in Rivas. Remainder of the trip back to my casita in Limón #2 was uneventful. When I arrived home, I received many hugs from the oldest to the youngest members of my Guzmán family. They took good care of my house while I was away. Although I had been promised by my landlord, one of the Guzmán daughters, that I would have an instant hot apparatus on my shower and screens on all the windows, none were in existence. The instant hot water item won’t work in the electrical environment of our compound. The two test products blew up on first try. So I will continue to take cold showers. Screens were promised to be installed at the end of the week and YEAHHHHHH indeed they were. I no longer have added insect protein with my dinner and it has cut down a lot on the blowing dust as well as no more leaves and small sticks coming from the trees. Now I can also leave my windows more open at night without creatures entering. Prior to the screens arrival, one night I had a visit from a 50 cent sized tarantula that I watched carefully as he/she made her way across the floor under my sofa and the next morning I found the largest scorpion I have seen here in NI in the second bedroom. The scorpion was already dead but the maid sprayed it with my permethrin–insect and mosquito repellant that I spray my clothes with in the morning before getting dressed. Needless to say, I am more than ecstatic about my house with screens. The progress on the Dos Hermanas commercial project is that I now have the Business Plan translated into Spanish and have given three more copies to potential investors. I honestly don’t plan on building anything on the property in 2014 as I believe it will take a year to get solid investors in the Dos Hermanas corporation. Cuidadores de Personas, the caregiving class that I started last year is also on hold for me. This is going to be my year of introspection and tranquilo here in NI. There is always enough activity in my life both here and in the US to keep me from being bored. Nicaragua feels like my true home and I hope that someday my US friends and family will take advantage of my invitation to visit. The photo is the young woman who waited on me on three different occasions in NI Immigration and was as happy as I that I finally received my cedula.